The title of this blog is a thought that can occur to anyone walking down Oxford Street on a sunny Saturday afternoon. Public spaces are always designed to be pleasant, welcoming spaces to spend time in, not just when you have to, but when you want to. If we consider Joe Londoner with some time to burn trying to decide what to do, maybe he will ask himself, “Should I go to Oxford Street?”. Part of that decision will be how enjoyable Oxford Street is on a Saturday afternoon. If Oxford Street is able to operate within its capacity (I’ll get on to what capacity can actually mean later…) then Joe is likely to remember that it’s an enjoyable place to visit, or comfortable place, as TfL would describe it. If he remembers only slow tourists and crowded pavements, he might decide to spend his time elsewhere. Therefore, Joe and others like him will only stop being attracted to the area when there is a certain degree of discomfort about spending time there. If we follow this thought, it stands to reason that one of two things will happen with any public space which seeks to attract visitors. More people will keep coming to the space until either; a) no more people can travel to the space, b)no more people can be accommodated by the space or c) no more people want to come to the space. Any restriction on the ability of people to go to a space comes down to accessibility and population, which Oxford Street has in abundance being in the centre of one of the world’s major cities with excellent transport links along its entire length. The key capacity threshold for places in highly accessible areas, like Oxford Street, is therefore determined solely by the characteristics of the pedestrian environment. This leads back to how we define capacity of pedestrian spaces. For road vehicles, the capacity of a link is relatively easy to determine, the linear flow of single or multiple lane traffic can be easily counted past a point, and a maximum flow can be observed with an associated speed and distance between vehicles(headway). Pedestrian flows are a little more difficult; bi-directional flows,different walking speeds and group behaviour add extra layers of complexity to our assessment. There are however a number of scales that can be applied. Perhaps the most widely used in the field of pedestrian planning is the Fruin Levels of Service scale, a ranked system of pedestrian comfort levels defined on average density measures. 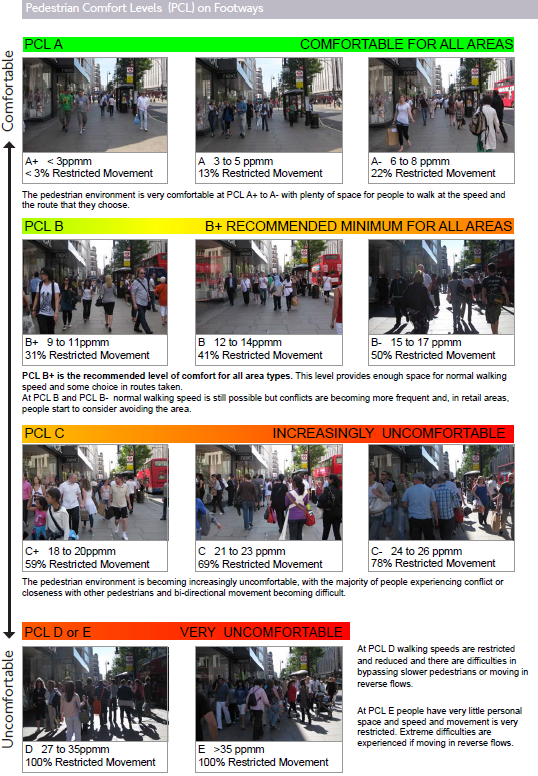 More helpfully for the consideration of a busy High Street environment, TfL define a range of ‘Pedestrian Comfort Levels’, ranging from PCL A+ as the most comfortable and PCL E as the least. TfL’s guidance states that if a High Street operates at or below PCL C, it is considered uncomfortable. If the number of people who want to visit Oxford Street was limitless,the New West End Company would need to implement systems to enforce patterns of movement that reduce conflict between opposing flows. This might involve erecting barriers and making pavements into one-way routes, but it’s fairly certain that people would be less inclined to visit such an environment just for the joy of a quick browse in Primark. Special exhibitions, such as the Lumiere London event, might be an exception to this response. It’s safe therefore to assume that,in general, the desirability of the space is more limiting than the accessibility. So when does this limit of desirability take effect? It’s not unreasonable to say that some high densities will be tolerated by people when visiting any city centre; a certain level of “busyness” is expected. The PCL scale defined by TfL gives qualitative as well as quantitative thresholds, so we can discuss where a city centre location may fall and what the effect on users is likely to be. Figure 2:Pedestrian Comfort Levels on Footways. 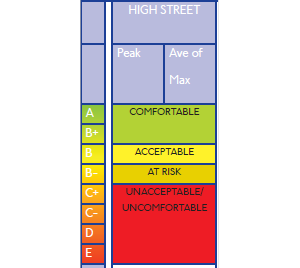 According to TfL’s guidance, the threshold of acceptability,what we can think of as a design capacity, is between PCL B and PCL C for High Street environments. To anyone who has visited Oxford Street or any city centre, particularly around Christmas or other busy times of the year, it is clear from the figure that these areas can and do often operate at the higher ends of this scale. So, should we be designing these spaces on the assumption that, to some degree, these environments are inevitably going to be operating at a level that exceeds the desired maximum? If we assume pedestrian densities are going to exceed our desired maxim a in accessible and densely populated cities, whether we like it or not, our next consideration should be how we can mitigate against the resulting negative impacts. As such, we can design spaces with higher capacity, without creating potentially dangerous situations for users. This might include the separation of modes, ensuring pedestrians, cyclists and vehicles are kept out of each other’s paths. This has been done at Oxford Circus in the redesign of the pedestrian crossings, which incorporate diagonal crossing movements. Foot ways are widened to ensure people are not forced to wait in the road, and underground exits are orientated such that they don’t contribute to an increased risk of pedestrians conflicting with traffic. Pedestrian crossings are also placed closer to desire lines (where the pedestrian wants to walk) and kerbs dropped to reduce the impact on walk speeds and flow rates for pedestrians crossing the roads. Thought can also be given to how an increased demand level will look in a High Street environment. In a simplified scenario where a foot way of uniform width is situated next to a cycle path and a road, a pavement operating at or near capacity is likely to result in pedestrians encroaching onto the cycle path,creating an unsafe situation for all users. This can be prevented by creating low density zones in the foot way, with benches or planting, which people can walk through when demand is high. This creates a more preferable ‘second choice’ to walking in the cycle path. This was the intention of the recent plans to pedestrianise areas of Oxford Street between Marble Arch and Tottenham Court Road, which would have seen all vehicle traffic removed from some sections of the route in stages. Changes to bus routes, moved to nearby streets or removed entirely, and a redesign of the entire width of the road would have seen priority given to the pedestrian on the route itself without compromise to accessibility. By designing spaces in this way, planning for a range of demand scenarios, we can create a safer environment for all mode users. If we consider the potential effects of high demand levels in the design stage, risks can be better managed. This will prevent areas needing mitigation features to be implemented once built, which can create incoherent and disjointed design. Pedestrian environments should be created with all users’ needs in mind, accommodating higher demand levels during peak times whilst maintaining safety and levels of comfort.